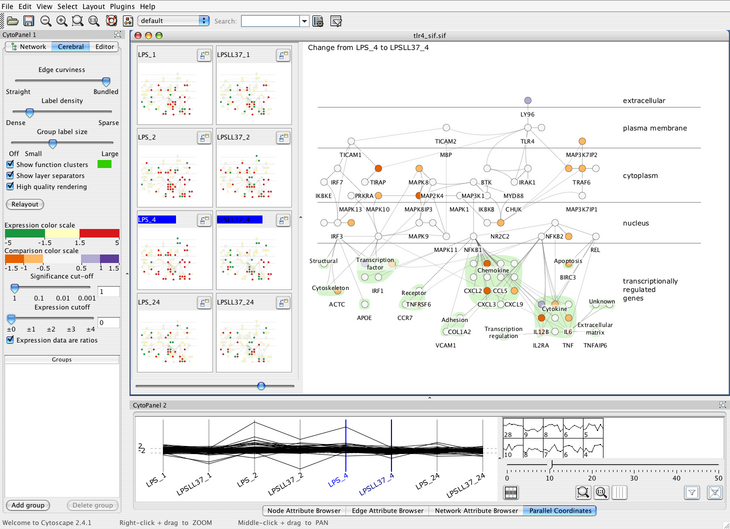 Systems biologists use interaction graphs to model the behaviour of biological systems at the molecular level. In an iterative process, such biologists observe the reactions of living cells under various experimental conditions, view the results in the context of the interaction graph, and then propose changes to the graph model. These graphs represent dynamic knowledge of the biological system being studied and evolve as new insight is gained from the experimental data. While numerous graph layout and drawing packages are available, these tools did not fully meet the needs of our immunologist collaborators. In this thesis, we describe the data display needs of these immunologists and translate these needs into visual encoding decisions. These decisions led us to create Cerebral, a system that uses a biologically guided graph layout and incorporates experimental data directly into the graph display. Our graph layout algorithm uses simulated annealing with constraints, optimized with a uniform grid to have an expected runtime of O(E√V). Small multiple views of different experimental conditions and a measurement-driven parallel coordinates view enable correlations between experimental conditions to be analysed at the same time that the measurements are viewed in the graph context. This combination of coordinated views allows the biologist to view the data from many different perspectives simultaneously. To illustrate the typical analysis tasks performed, we analyse two datasets using Cerebral. Based on feedback from our collaborators, we conclude that Cerebral is a valuable tool for analysing experimental data in the context of an interaction graph model.